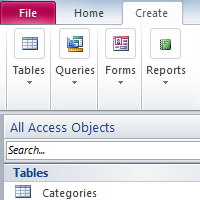 Databases in Access 2010 are composed of four objects: tables, queries, forms, and reports. Together, these objects allow you to enter, store, analyze, and compile your data as you wish. In this lesson, you will learn about each of the four objects and come to understand how they interact with each other to create a fully functional relational database.